Our refurbished Psion Teklogix 7535 units are professionally serviced to meet or exceed factory settings. 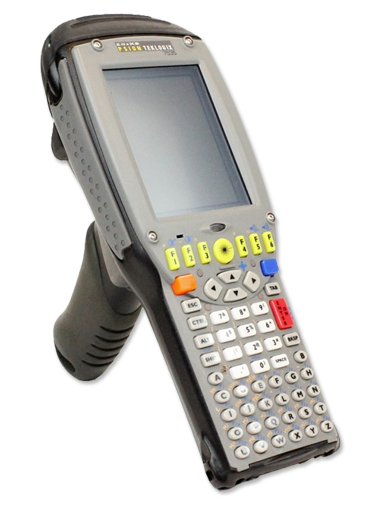 We sell refurbished Psion Teklogix 7535 barcode scanners. We also service and purchase used Psion Teklogix 7535 devices. Your employees gain the freedom of movement to serve customers and engage in data entry according to the immediate needs of your enterprise. Contact us today about buying, servicing, renting or selling Psion Teklogix 7535 gear! Our refurbished Psion Teklogix 7535 Workabout Pro units are designed for warehouse environments and features a drop rating of 1.8 meters to polished concrete. An IP65 rating makes it impervious to dust and moisture, and it can withstand extremes of -10 to +50 degrees C (14 to 122 degrees F) and just keep working. The refurbished Psion Teklogix 7535 is light, well balanced and sits comfortably in any size hand. The bright 1/4 VGA display is visible even in direct sunlight. The backlit, hard-capped keypad won’t wear out, can be used in all lighting conditions and provides exceptional tactile feedback for ease of operation. The Psion Teklogix 7535 is Windows-based and slots into your existing wireless infrastructure and applications hassle-free. Integrated Bluetooth and Wi-Fi connectivity ensure that the Psion Teklogix 7535 is never out of contact. Contact us today about buying, servicing, renting or selling Psion Teklogix 7535 gear!